Jasmin, based at Bovis Homes’ West Midlands regional office in Coleshill, and Lillie, located at the Northern Home Counties region in Milton Keynes, said that having a hunger to learn about the trade, customer service and digital tools was an important part of their success. 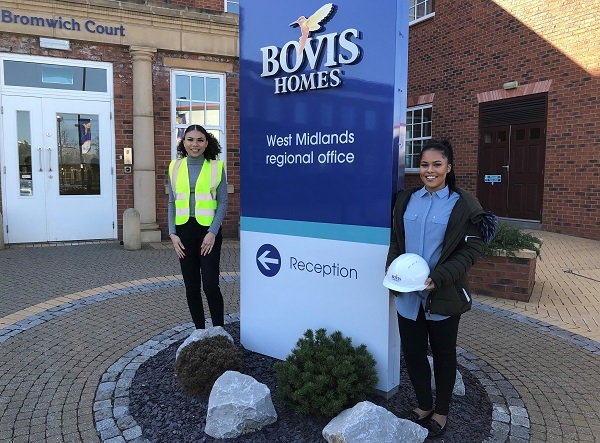 Jasmin, from Sutton Coldfield, who found out about the apprenticeship online, said: “I’ve worked in both the build, and sales and marketing teams and it’s the people at Bovis Homes who are making my time here so rewarding. “I’m learning a huge amount about the site locations and what goes into selling homes and I would love a full-time role at Bovis Homes. Jasmin, who trains as an athlete in her spare time, has been with the housebuilder for six months and works on the company’s website, internal communications, invoices and customer welcome packs. Lillie, who joined Bovis Homes at the same time and also discovered the apprenticeship online, said she had enjoyed learning about the variety of roles within the housebuilder. “I’ve been working on tasks for many Bovis Homes departments and picked up new skills and improved my understanding as a result,” she said. “I have a lot of admiration for people who work in the sector, including those who work in customer service and finance, as well as those out on site building people’s homes. Lillie, from Dunstable, has been working on budgets, finance reports, meeting packs and in customer care. Both Jasmin and Lillie are studying online at Derby-based college, Babington, and taking part in year-long apprenticeships, which could be extended to 18 months. Outside of work, Jasmin runs for Birchfield Harriers in Birmingham. She aims to compete in the English Schools’ Athletic Association championships at U20s level, in the 400 metres. Jasmin runs six days a week, fuels herself with six meals a day, and her role model is American Olympic multi-gold medallist Allyson Felix. Paul Bennison, marketing manager at Bovis Homes’ West Midlands region, said Jasmin had made an impressive impact. Amy Ingram, regional finance manager at Bovis Homes’ Northern Home Countries region, added Lillie’s enthusiasm and work ethic had brightened up the office.